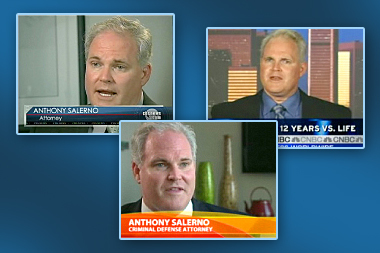 Mr. Salerno appears frequently in the media, both in connection with the firm’s own cases, as well as on other cases in the news. When commenting on the firm’s cases the goal is always to put our clients in the most favorable light possible. Mr. Salerno’s appearances have included CBS Evening News with Katie Couric, ABC’s Good Morning America, CNN Headline News, and CNBC’s Kudlow & Company.